Meet Goldivox. She's pretty similar to the classic fairytale character Goldilocks, except for one main difference. 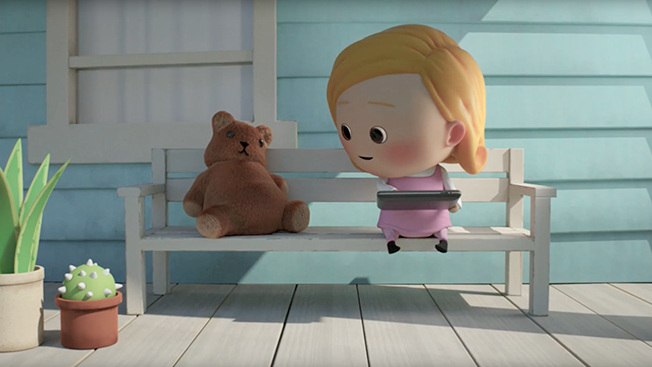 Goldilocks set off on a journey to find a perfectly prepared bowl of oatmeal, while Goldivox, a speech-impaired young girl, sets out on a quest to find the perfect voice for her. The charming storyline is part of voice company VocaliD's first marketing campaign, created by Saatchi & Saatchi New York, touting the Voicebank product. Voicebank allows anyone—with all different accents and dialects—to donate their voices for the speech impaired, giving them a voice of their own. Those looking to make a donation need to read 3,500 carefully constructed sentences that capture all the different sounds and sound combinations in the English language. The spot, which has an interactive component for viewers to record their own voice and can be watched here, opens on young Goldivox typing away on a tablet, explaining that the automated voice she uses to communicate with the world does not fit her. She packs up her hot air balloon and sets off on an adventure where she meets a range of characters from a man and his camel in Egypt to a pack of sheep in a field. "The isolation of not having a voice of your own, I think it captures all of that without bringing it into a deepness or sorrow, it creates the light side of that. It's beautifully metaphorical," VocaliD founder and CEO Rupal Patel told Adweek. A few Saatchi & Saatchi New York creatives reached out to Patel after watching one of her TED Talks on synthetic voices and her company VocaliD. The idea behind the voice company is to help people living with voicelessness find their own unique and real voices rather than relying on text-to-speech devices, similar to the one Stephen Hawking uses to communicate. Brad Soulas, associate creative director at Saatchi & Saatchi New York, said after the team saw the work Patel and VocaliD were doing, they immediately knew they needed to be part of it. At first, the work consisted of designing and creating educational brochures, but the work soon evolved into something bigger. Deciding between animation and a documentary-style film featuring real people, the team at Saatchi thought an animation film was the best route. "I think the thing that animation afforded us was telling a story that anyone with a speech or voice assist would identify with. It felt like we could tell one story that sort of spoke to every single person," Soulas told Adweek. The Goldivox work marks VocaliD's first marketing campaign, timed to launch just before the company's custom voices open up to a larger group later this summer or early in the fall. Patel said she hopes the campaign will drive more people to start and complete their voice donations online. Beyond that she hopes "it sparks a lot of conversation and dialog about what voice is and how important it is," Patel said. You can participate in the full experience at the Voice of Goldivox website, here.